Abstract The purpose of this investigation wasto examine the effects of 6 wk of oral creatine supplementation during aperiodized program of strength training on arm flexor, bench press and squat1RM, and body composition. Eighteen collegeathletes volunteers with at least 1 year of weight training experience randomlyassigned to two groups of creatine(Cr, n=9) and placebo(P, n=9) with nosignificant mean at pretest measures. Cr group received 20 g.d-1 ofcreatine for the first 6 d in 5-g doses, four times daily, followed by 5 g.d-1for reminder of the study. Each 5-g dose was mixed with 500 mL of glucosesolution. The P group received a placebo (starched, sucrose drink) followingthe exact protocol as the Cr group. All subjects’ resistance trained 3 d.Wk-1.Measurement of 1RM strength of arm flexors,bench press, and squat and body composition were made pre- and post-trainingafter supplementation while monitoring dietary intakes. Results showed bodymass and lean tissue mass increased to a greater extent with training in Crcompared to placebo group (p< 0.05). There were no significant changes inpercent body fat for either group. Cr group demonstrated greater improvement in1RM of squat, bench press and arm flexors than placebo group. These datasuggest that creatine supplementation during strength training may be superiorto training alone for enhancing muscular strength and body composition. Bagherzadeh, Fazlullah. Sheikh, Mahmoud. Tahmasby Boroujeni, Shahzad. Shahbazi, M. (2005). "Bidirectional transmission of the SMS Service badminton skills superior to non-dominant hand and vice versa." Journal of HAREKAT . No. 21 - pp. 45-50. Brenna, Saba. Torabi, F. Aghayari,Azar. Karimi, Ali. (2001). "Effect of focus of attetion on acquisition, retention and transfer Mini Badminton service skill." Articles Collections of the Sixth national Conference on Physical Education and Sport Sciences, Tehran,Iran,2001 pp. 60-63. Fvladyan, J. Sohrabi, M. Zadeh's, vakil zade, Akram. (2008). "Effect of sequence training the lateral transition of short badminton services." Articles Collections Sixth International Conference on Physical Education. Tehran 2008. Pp. 52-54. Beilock, S.L., Carr, T., MacMahon, C., &Starkes, J.L. (2002). “When paying attention becomes counterproductive: Impact of divided versus skillfocused attention on novice and experienced performance of sensorimotor skills”. Journal of Experimental Psychology Applied, 8, (1), PP: 6-16. Byrd, R., Gibson, M., & Gleason, M. H. (1986). “Bilateral transfer across ages 7 to 17 years”. Perceptual and Motor Skills, 62(1), 87–90. Criscimagna-Hemminger, S. E., Donchin, O., Gazzaniga, M. S., &Shadmehr, R. (2003). “Learned dynamics of reaching movements generalize from dominant to nondominant arm”. Journal of Neurophysiology, 89, 168–176. Gabriele Wulf. (2013). Attentional focus and motor learning: a review of 15 years. International Review of Sport and Exercise Psychology.Volume, Issue 1, 2013. Haaland, E., & Hoff, J. (2003). “Non-dominant leg training improves the bilateral motor performance of soccer players”. Scandinavian Journal of Medicine & Science in Sports, 13, 179–184. Laszlo, J. I., Baguley, R. A., &Bairstow, P. J. (1970). “Bilateral transfer in tapping skill in the absence of peripheral information”. Journal of Motor Behavior, 2, 261–271. Masters, R.S.W., Maxwell, J.P. (2004). “Implicit motor learning, reinvestment and movement disruption: What you don’t know won’t hurt you?”. In A.M. Williams & N.J. Hodes (Eds), Skill acquisition in sport: Research, theory and practice (PP: 207-228). London: Routledge. Maddox, M.D., Wulf, G., & Wright, D.L. (1999). “The effect of an internal vs. external focus of attention on the learning of a tennis stroke”. Journal of Exercise psychology, 21, P: 878. Maxwell, J.P., & Masters, R.S.W. (2002). “External versus internal focus instructions: Is the learner paying attention?” International Journal of Applied Sports Sciences, 14, (2), PP: 70-88. Maxwell, J.P., Masters, R.S.W., &Evea, F.F. (2003). "The role of working memory in motor learning and performance". Conscousness and Cognition, 12, PP: 376-402. McNevin, H., &Wulf, G. (2003). "Increasing the distance of an external focus of attention enhances learning". Psychologyical Research, 67, PP: 22-29N. Neumann, David L.; Brown, Justine (2013). The effect of attentional focus strategy on physiological and motor performance during a sit-up exercise. Journal of Psychophysiology, Vol 27(1), 2013, 7-15. Doi: 10.1027/0269-8803/a000081. Parlow, S. E., & Kinsbourne, M. (1989). “Asymmetrical transfer of training between hands: Implications for interhemispheric communication in normal brain”. Brain & Cognition, 11, 98–113. Perkins-Ceccato, N., Passmore, S.R., & Lea, T.D. (2003). "Effects of focus of attention depend on golfers, Skill". Journal of Sports Sciences, 21, PP: 593-600. Puretz, S. L. (1983). "Bilateral transfer: The effects of practice on the transfer of complex dance movement patterns". Research Quarterly for Exercise and Sport, 54, 48–54. Sainburg, R. L., & Wang, J. (2002). "Interlimb transfer of visuomotor rotations: Independence of direct and final end position information". Experimental Brain Research, 145, 437–447. Shea.C.H. & Wulf.G. (2001). "Surfing the implicit wave". The Quarterly Journal of Experimental Psychology, 54 a (3), PP: 841-862. Stöckel, T., Hartmann, C., ErlernenkomplexersportmotorischerFertigkeiten EineBasketballuntersuchungbeiSchulkindern [Bilateral practice effects on the acquisition of complex ZeitschriftfürSportpsychologie, 14(3), 130–135. (2007). beidenKörperseiten- sport skills—A basketball study with school children]". Taylor, G. H., & Heilman, K. M. (1980). "Left hemisphere motor dominance in right handers". Cortex, 16, 587–603. Teixeira, L. A. (2000). "Timing and force components in bilateral transfer of learning". Brain and Cognition, 44, 455–469. Teixeira, L. A., & Caminha, L. Q. (2003). "Intermanual transfer of force control is modulated by muscular strength". Experimental Brain Research, 149, 312–319. TinoStockel, Matthias Weigelt, Jürgen Krug. (2011). "Acquisition of a Complex Basketball-Dribbling Task in School Children as a Function of Bilateral Practice Order". Research Quarterly for Exercise and Sport. Vol. 82, No. 2, pp. 188–197. Whitehouse, Matthew (2012). The effect of attentional focus on the performance and learning of a motor skill on adolescent soccer players.M.Phil. Thesis, University of Birmingham. Wolf, Gabriele. (2007). "Attentional focus and motor learning: A review of 10 years of research".E- Journal Bewegung und training,1.4-14. Wulf, G., McNevin, N.H., & Shea, C.H. (2001A). "The automaticity of complex motor skill learning as a function of attentional focus".QuarterlyJournal of Experimental Psychology, 57A, PP: 1143-1154. Wulf, G., & Prinz, W. (2001). "Directing attention to movement effects enhances learning: A review", Psychonomic Bulletin & Review, 8, PP: 648-660. Wulf, G., Shea, C.H., & Park, J.H. (2001B). "Attention in motor learning: Preferences for and advantages of an external focus". Research Quarterly for Exercise and Sport, 72, PP: 335-344. Zachry, T., Wulf, G., Mercer, J., & Bezodis, N.(2005). "Increased movement accuracy and reduced EMG activity as the result of adopting an external focus of attention". Brain Research Bulletin, 67, PP: 307-309. ISNAD Garazhian, Yaser , Azimkhani, Amin . "COMBINED EFFECTS OF PROLONGED CREATINE SUPPLEMENTATION AND RESISTANCE TRAINING ON MUSCULAR STRENGTH AND BODY COMPOSITION IN COLLEGIATE". 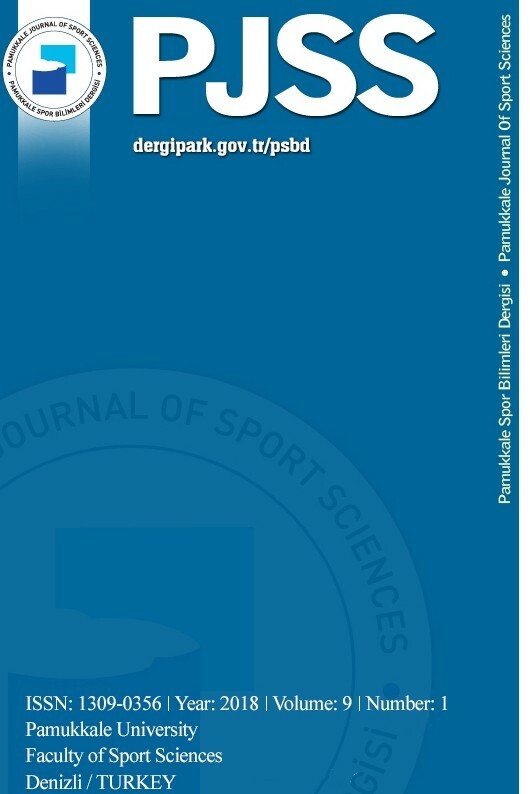 Pamukkale Journal of Sport Sciences 5 / 2 (May 2014): 75-84.